It's my pleasure to welcome debut author Rachael Miles to TRD today. 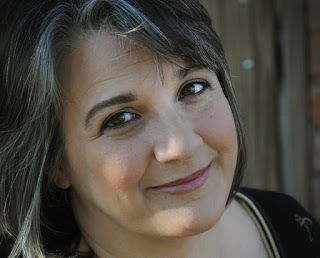 Rachael writes romance novels set in the British Regency. Her debut series--The Muses' Salon--is being published in 2016 by Kensington Zebra Shout. Her first novel--Jilting the Duke--has been called a "cosily scrumptious historical romance' by Publisher's Weekly and is the recipient of a 4 star review by RT Book Reviews, which described it as "charming, sweet, and sensual." Cathy Maxwell praised her second novel, Chasing the Heiress, saying "Intrigue, romance, adventure, Chasing the Heiress has it all!" Identified as a 'strong new voice' by Mary Jo Putney for Omnivoracious.com, Miles is a former professor of book history and nineteenth-century literature. She edits the digital archives, Nineteenth-century Women Writers Reviewed and the internationally award-winning Texas Manuscript Cultures. A native Texan​, Miles lives ​in the woods ​with ​her indulgent husband, three rescued dogs,​ an ancient ​c​at​, and a herd of deer who love her vegetable garden​. Welcome, Rachael! Congratulations on the release of your debut book, Jilting the Duke. What should readers expect from this historical romance? I started Jilting the Duke with a question. What would you do if your worst enemy became guardian of your child? And what if that enemy used to be your best friend? It seemed to be a perfect starting point: all that intimacy gone awry, then brought back into contact, but with the addition of a power dynamic. That’s the situation Sophia Gardiner, Lady Wilmot, finds herself in at the beginning of the book, co-guardian with Aidan Somerville, Duke of Forster, a man she once loved and has never been able to forget. But Aidan sees the co-guardianship as a way to punish Sophia for deserting him all those years ago. So, the two come into contact again with very different motives, only to have those motives shift when it becomes clear that Sophia and her young son are in danger. As you mentioned above, Jilting the Duke is a second-chance love story with a revenge twist. What is it about the combination of these two tropes that intrigues you as a writer? I think these two tropes work so well together because they both require forgiveness. In revenge stories, society is fractured: justice has been denied—for whatever reason—to those who deserve it, and the hero or heroine is left to repair the fracture. But without justice, the fracture ripples wider and wider. Think of Hamlet. In gaining his revenge on the man who murdered his father, Hamlet kills or causes the death of his girlfriend, her brother and father, his mother, his uncle, himself, and two university friends. Only one thing can keep the fracture of injustice from erupting into revenge: love. But to love requires the characters to forgive the injustice that started the whole cycle. A second-chance love story doesn’t necessarily start at the same spot as a revenge story—our characters may not want each other dead. But there is still a fracture that separates the characters: a breach left by whatever it is that kept them apart--family, obligation, ambition, misunderstanding, etc. But before the characters can love one another, they have to heal that breach, and that happens (again) through forgiveness. In Jilting the Duke, then, when Aidan vows revenge for Sophia’s betrayal, that vow carries with it the threat of real destruction, even though the ‘death’ he imagines for her is a social one (rejection by the ton, scandal, etc). But revenge (as Aidan’s valet warns him) is insidious—and even when Aidan thinks he’s set revenge aside to take that second chance, until he forgives Sophia—and she him—the possibility for all sorts of unexpected fractures remains very real. And with a villain who wants Sophia dead, those fractures create opportunities for danger. Our heroine, Sophia is an intelligent, educated woman with a passion for botany. Do you have a green thumb? What plants will be blooming in your garden this year? I loved making Sophia a botanist. It was an acceptable pursuit for women in the period, but it also drew on my own love of plants and landscapes. As for me, though, my green thumb depends on the plant. Somehow I can keep an orchid alive and happy, but I can’t grow tarragon. As for what will be blooming in my yard, I have no idea, and that’s great fun! We recently moved from a semi-arid flat desert (where everything we planted had to be drought and heat tolerant) to a hilly, water-rich landscape, and our new yard shows the remains of a past garden design. This year, then, I’m watching to discover what already lives in the yard. All day today, I enjoyed a lone yellow crocus with magenta stripes down the petals. What led you to write historical romance? My path to writing historical romance is a pretty wayward one. I read my first historical romance when I was in elementary school--Elizabeth Marie Pope’s The Perilous Gard. The book brought together history (Renaissance England) and magic (the faery folk) and the English ballad tradition (Tam Lin). But what made me read the book over and over again was its plain-faced heroine, Kate: smart, resourceful, and determined, Kate makes decisions that change the landscape of her world. I wanted to write stories like that—and over the years I wrote dribs and drabs of stories (always historical). But I had an academic career, teaching 19thC literature and book history, and I focused my energy into recovering the work of long-forgotten women writers and publishing about those women. And for a long time, I thought that was the place that my writing path ended up. Then Jodi Thomas came to talk to my book history course about the contemporary book market, and at lunch (the closest thing I could offer to an honorarium), she asked, “Now, honey, what are you going to write?” It’s funny how a single sentence can reorient your whole world. And pretty soon, my brain—so full of 19thC details—began to reshape those pieces into stories. It’s been fascinating and oh-so-much fun. I love a book that pulls me into its spell so completely that I end up reading well past my bedtime (as Jilting the Duke did). What’s the last book that kept you reading well into the night? I have absolutely no discipline when it comes to reading. If I start reading a book, and it’s engaging, I will most often read until I finish. But I’ve been trying to reform. Right now, I’m trying not to read in one gulp Amanda Stevens’ The Visitor. I read the first three in her Graveyard Queen series several years ago, so I was excited to see this one come out. What’s been the most fun part of being a published romance author? The most challenging? The most surprising? Strangely, the most fun is the process—seeing a book move from idea to manuscript to a book in a reader’s hands. Along the way, you get these lovely bursts of pleasure: there’s an email with your cover image, then the fat package with your proofs (in which the MS suddenly looks like a book! ), then the ARCs that you pet while mailing them out to reviewers, then the moment when you (gasp) see your book on a shelf at a bookstore. After that, you have lovely encounters with readers who have read your book. So, each successive pleasure gets replaced by the next—it’s really quite nice. The most challenging. That’s harder. What’s most challenging depends on the place we are in the process. Since it’s been a difficult year—my father died unexpectedly in the fall and my mother has been in and out of the hospital since then—the most challenging thing with book 3 was finishing it. But now that Tempting the Earl is in production, I’m having more opportunity to engage with readers who have read Jilting, and that’s simply delightful. But every once in a while, I’m grateful that I spent almost 30 years teaching, so I’ve perfected (I hope) not visibly reacting when someone says something unexpected about romance in general or my book in particular or its cover. That unexpected thing isn’t always bad—it’s just the unexpectedness of it that is challenging. The most surprising. I’m consistently surprised at how generous and kind and welcoming the community of romance writers is. Jodi Thomas and Cathy Maxwell have offered me very helpful advice on the business side of the industry. My agent, Courtney Miller-Callihan, has recently started her own agency—Handspun Literary—and one of her first acts was to throw all her clients together on a private facebook page. It’s a great collegial group with wide-ranging expertise and knowledge. A writer’s life can be very solitary, and the Handspinners (our name for ourselves) make me laugh every day. Will you be attending any book signings this year where readers can meet you? I’ll be at RWA in San Diego, but I’m also pretty flexible. If readers have a book club and want me to come talk, I can usually arrange it! I’ve already been to Albany, Chicago and Denver for signings, and it’s been great fun. I love to hear from readers! My website is rachaelmiles.com, and in addition to my blog on topics historical, every week I release materials transcribed from 19thC magazines. I’m also on Goodreads (Rachael_Miles), Facebook (RachaelMilesAuthor), Twitter (rachael_miles1), and Pinterest (miles3275). I'm eagerly anticipating your next book, Chasing the Heiress, which will be released on May 31st. What can you tell us about this story? Chasing the Heiress begins as a sick-room romance: our hero—Colin—and our heroine—Lucy--first meet at an inn. He’s been shot, and she becomes his nurse. Their attraction is immediate and unexpected and problematic. What I like most about these two is that they have secrets, but they are very open with each other about having them, and each one accepts that the other simply can’t, for whatever reasons, confide those secrets. And of course those secrets almost destroy them. Thank you for visiting with us today, Rachael. Would you like to ask our readers a question? I’d like to know what plant they love to grow and why. For me, it’s rosemary—which a dear friend who does aromatherapy tells me ‘reminds you of your true self’—isn’t that a lovely thought? 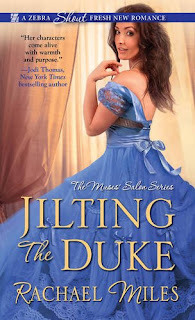 Rachael is generously offering a print copy of her debut historical romance, Jilting the Duke to one randomly chosen person who leaves a comment on today's post. (U.S. only) And, because I enjoyed it so much, I'm giving away a Kindle copy of the book! Deadline for comments to be entered in the giveaway is 11:00 pm, April 23 (EST). Welcome, Rachael! It's such a pleasure to host you today. As you know, I thought Jilting the Duke was wonderful and I am so excited to get lost in Chasing the Heiress. Not long now! Thanks for hosting me! You ask great questions. 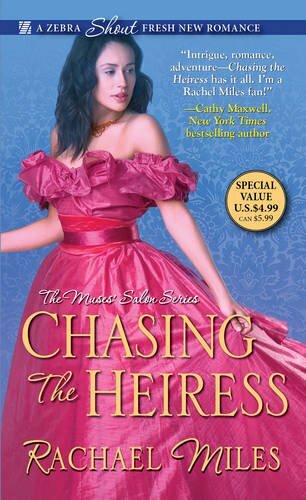 I hope you like Chasing the Heiress as well: this week RT Book Reviews gave it 4 stars. So, that's good news! I grow basil which is so delightful and special. I love the scent and use it in many recipes and for many uses. Thanks for this lovely feature. I love basil! I planted some in my patio planter this week. I love basil too, and I often grow several different varieties. I have a collection of articles archived on my website on the Language of Flowers and Plants. I've just made the entry for 'basil' live! If you want to read what the 1819 Belle Assemblee published about basil and its meaning, go to my website, click on life in the regency, then science. Lavender is my favorite for many years. I love the color, smell and it helps soothe me. Your books sounds captivating. Traveler, I hope you like the book. Lavender plays an important part--even though in the 19thC it carried associations of disunion. Culpepper's English Physician says the herb belongs to Mercury (the god/planet, not the element). I just plant flowers. My favorite to plant at my house is Vinca. It can survive the Georgia heat and sun, and it spreads like crazy. I don't even have to have a green thumb for it to thrive! I have never planted any herbs. Can you recommend one that even a brown thumb like me can keep alive? Cheryl, last year I planted basil, rosemary, and citronella. I had a hard time keeping the rosemary alive but the sweet basil and citronella took off like gangbusters. And I'm not known for having a green thumb! I'd start with any herb--they typically like heat and sun. Basil is an easy happy plant, and you can grow it indoors or out. When I was in the dry West, I simply put it on a morning drip and let it go. To eat it all summer, just pinch back the blossoms. The trick with most herbs is that they like water but not dry feet. Rosemary is particularly picky about that--and rosemary doesn't like growing indoors (despite all those lovely topiaries we see in pots). Rachael is having trouble getting her comments to post. We're working on getting it straightened out and, hopefully, she'll be able to join us soon. Congratulations on your new career. I enjoy second chance at love tropes with a little revenge thrown in. I don't do a lot of planting, but when I do, it's usually basil. Thanks, Kim! I hope you like the book--there's plenty of revenge to go around. That's a lovely memory: thanks for sharing it, Stefany. It's a wonderful fragrance--now I need to buy some and plant it! I planted a citronella geranium this week. I had one last year too. I love the fragrance! I use to always grow tomatoes and green onions with trying this and that each year. I had to get a job so I just don't have the time and energy this year - hopefully, once I'm use to this new schedule I'll get back to planting - I love watching them grow and the final product is wonderful too! I hope you find time too. There's something so happy about watching a plant grow. In the dry West, I never had great luck with tomatoes--I'd have lots and lots of green but no buds. I'm hoping a new climate will bring me better tomato-luck! I hope you're able to acclimate to the new working schedule soon. Now that I'm in a condo, I don't have space for growing veggies so I make it a point to visit my local farmer's market each week during the summer. Nothing better than fresh fruits and veggies! Hi, Natasha! I hope you like it when you get to it. My TBR pile is huge right now. I love mint too. For you, I've just published an 1819 article on mint on my website. It tells me (among other things) that Mint was once a lovely Grecian girl who was turned into a plant during a fight between Proserpine and Pluto! I grow saffron, roses, and tomatoes. Hi, Denise! I've never grown saffron, but I've always wanted to try. I had 4 articles on Roses from 1819, so I've made them all live. Unfortunately, the Regency wasn't interested in the language of vegetables! so nothing on 19thC views of tomatoes! I have a bit of a brown thumb - haven't had a lot of luck with growing things. I have a Christmas Cactus my niece gave me last November & it's still alive - I'm trying to not overwater it. She gave me a 'basil growing kit' which I haven't started yet, but I have hopes that it will do well - I do love fresh basil! Di, I think keeping anything alive for five months is a great accomplishment if you have a brown thumb! I've never kept a tarragon alive for that long! Water well basil, then let it get dry about an inch down before watering again--that should help! But be brave! Start! Congrats on the new release! LOL.. I have a black, killer thumb. So I just admire everyone else's flowers and green things. But I do like the scent of lavender and roses (not together) :) Thanks for sharing! Congratulations on your wonderful debut book and on your new release! Unfortunately, I don't have a green thumb. Even the flowers or floral arrangements that I get wilt at the sight of me! No such thing as a garden in my house, ha! Perhaps I'll need to write a heroine with a black thumb to even it all out! Congratulations Rachael on your debut book I love second chance romance and add a little revenge I'm hooked. Looking forward to reading both books. Sorry to say I have no gardening skills although I have tried. Carol, I hope you enjoy them: they were fun to write. As for gardening, I think I got it from my dad who could make anything grow.